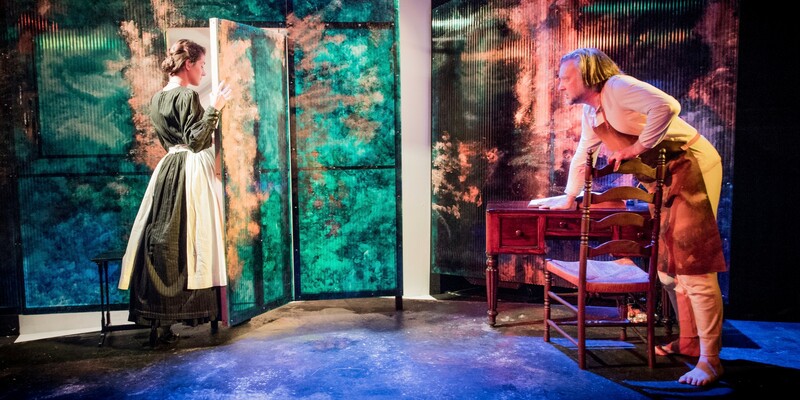 By coincidence, one of the last reviews I did last year was of a double bill in this theatre of two lesser known Strindberg plays, The Stronger and Storm, both involving women, wives and the theatre. In The Stronger (written when he was still with his first wife, Siri), a wife encounters her husband’s possible younger lover in a cafe. 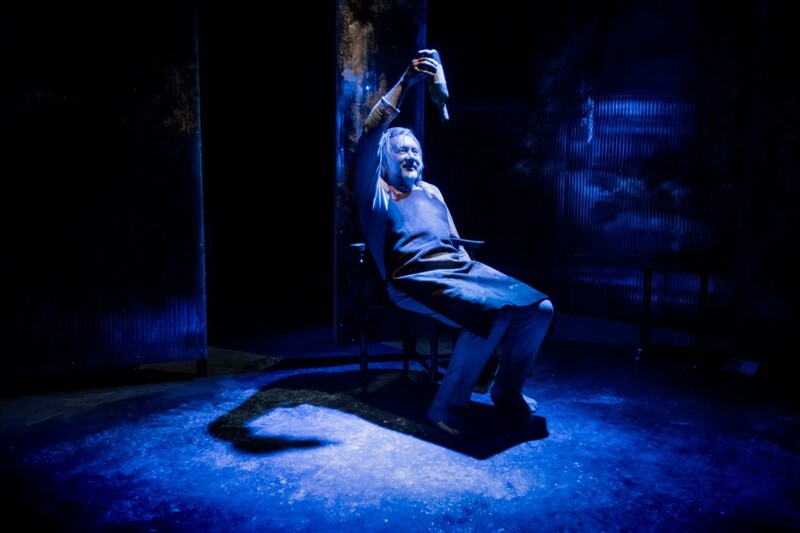 Storm, written later and inspired by his third wife, Harriet, paints a portrait of a husband (the estimable Paul Herzberg, now in the NT’s acclaimed Oslo production) luxuriating in a rural idyll, free of wives but haunted by ghosts, before finding himself once more becoming `involved’. 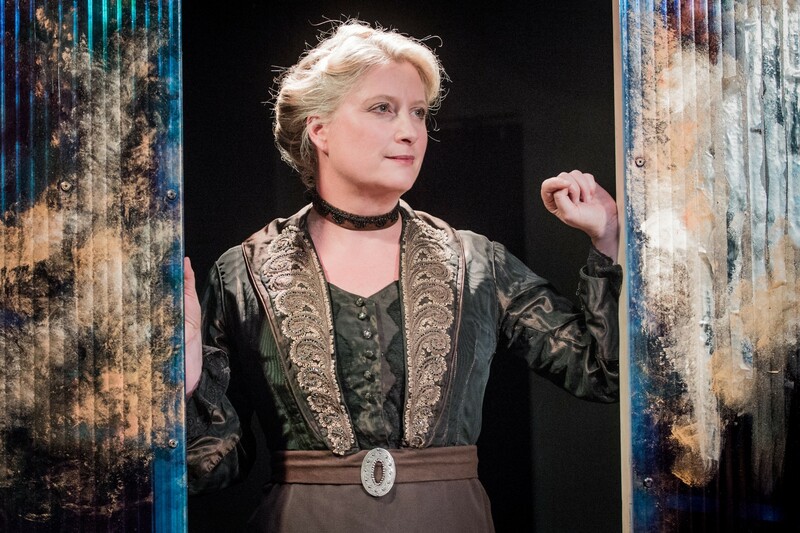 Now we have Howard Brenton’s latest, in what is a definite coup for the Jermyn Street Theatre’s new artistic director, Tom Littler, filling in gaps around Siri, Strindberg’s second wife Frida and even a glimpse of the young woman who will become, his third, Harriet, in the future. A companion piece of sorts, then, to The Stronger and Storm, with typical panache, Brenton gives us a barn-storming role for the actor playing Strindberg – in this case Jasper Britton – and the women who appear in his life, Siri (Susannah Harker), Frida (Gala Gordon) and chamber-maid, latterly Harriet (Laura Morgan). 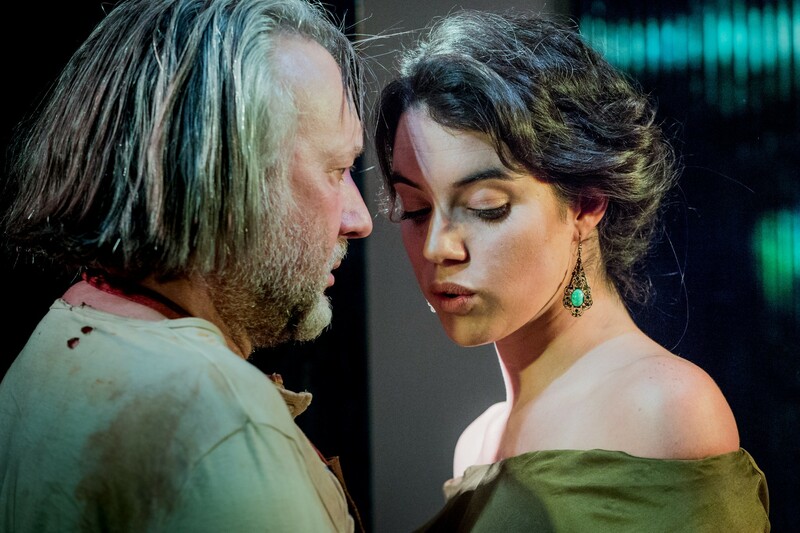 © Robert Workman, Jasper Britton as Strindberg and Gala Gordon as his second wife, Frida. Brenton’s meaty main focus here, though, as well as providing a fascinating psychological exploration into his protagonist’s relationships with Siri and Frida is also concerned to discover Strindberg’s state of mind in the period of his life which saw him abandoning the theatre to hide away in a tatty hotel in Paris, obsessively in search of the Philosopher’s Stone and practising alchemy convinced that he could turn dross to gold. Brenton has struck on a wonderful metaphor for mental breakdown of which I suspect R D Laing would have heartily approved. In the final moments of the play, Strindberg’s lists the seven stages of alchemical creation, starting with `putrefaction’. It entails stripping away, `separating’ the old (`things of which we are ashamed’) until in the ultimate `coagulation’, `the base, dull and compromised’ are transformed into `incorruptible gold…the soul returns to the Garden of Eden, in a blinding light. ..And you are free’: a longed for state from Strindberg, the radical-conservative, free-thinking Christian and believer. But before this `enlightenment’, Brenton shows us the paranoid absinthe-addicted artist hearing voices and seeing demons and his alter-ego self in walls. 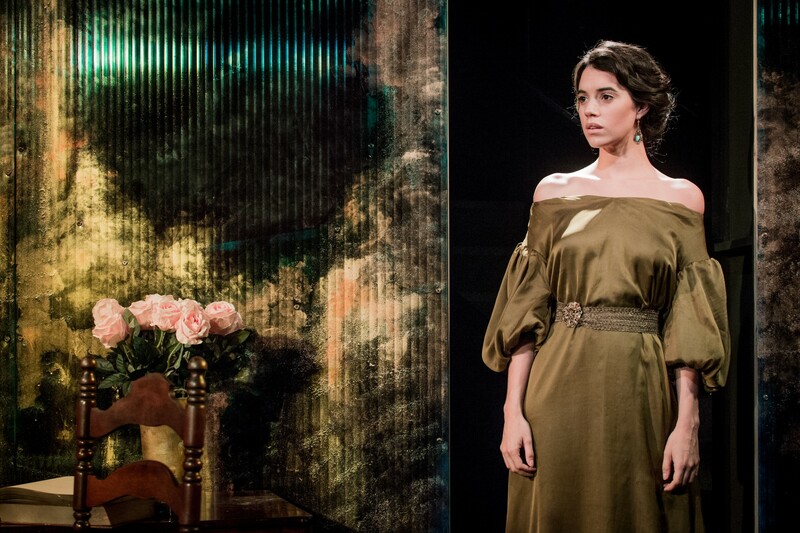 Into this delusional picture comes Susannah Harker’s Siri and later Gala Gordon’s Frida. Both are superbly well cast. Harker, oozing the seductive fury and control of a discarded wife, mother of his children, and sometime actress, seems to symbolise all the attraction and disgust of Strindberg’s marital incompatible yet irresistibly drawn men and women, enjoying nothing so much as the battles they create in each other. The air crackles with electric tension as she and Jasper Britton’s Strindberg, one moment the victim, the next the attacker, slug it out. But Gala Gordon’s exotic, posh girl Frida, too, also brilliantly radiates that young femme fatale force of nature to which Strindberg seemed so fatally drawn. And they to him. Britton has perhaps the hardest task, conveying the madness, the distraction, and the alchemical wonders racing in Strindberg’s brain so richly painted by Brenton. He rises magnificently to the occasion in Cherry Truluck’s clever hermetic set of gold-embossed screens, at one point producing a ventriloquist `second’ voice as his demonic anti-self. Ben Jonson’s The Alchemist turned alchemy into a con-man’s dreams. Snoo Wilson, of blessed memory, also dabbled from time to time (The Glad Hand). Brenton also uses levity but you can tell has serious enquiry behind it regarding an artist in free-fall, re-inventing himself and his art whilst throwing in a few pungent swipes at theatre pretensions. Director Tom Littler gives the whole a grubby yet hallucinogenic style with a soundscape from Max Pappenheim suggesting cracking systems and eerie other worlds. All in all, a great start to Littler’s tenure. Classy! 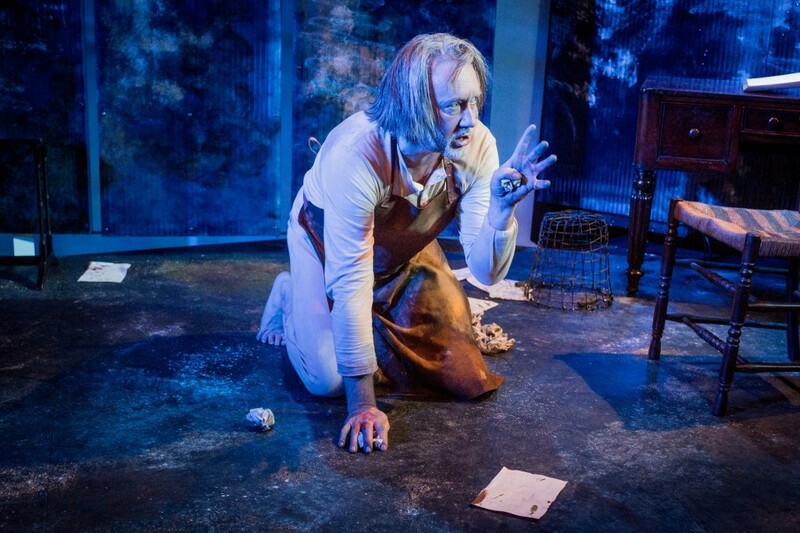 This entry was posted in 2017, Reviews and tagged Cherry Truluck, Gala Gordon, howard brenton, Jasper Britton, Jermyn Street Theatre, Laura Morgan, Max Pappenheim, re-appearing wives, Strindberg and alchemy, Susannah Harker, Tom Littler, transmutation on September 21, 2017 by Carole Woddis.